"Cheese on our grits, darlin', please." Aside from maybe two movies in his career, John Travolta has never done much to impress me, even going so far as to down right annoy me at times. His career renaissance was warranted, given his remarkable performance in Pulp Fiction, but, aside from Get Shorty, Travolta really hasn't made a good movie in the last 10 years. 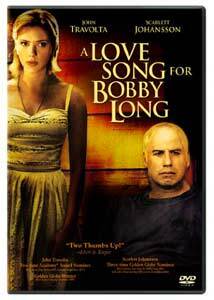 2004's A Love Song for Bobby Long is Travolta's attempt to dial it down a bit. His role here as a downtrodden, alcoholic ex-college professor is far removed from his usual action, or dancing roles that have stunk up multiplexes for far too long. Travolta gives a surprisingly good, complex (which is really stretching for him) performance as the title character, but, unfortunately, the film is far too slow, with an undeveloped script in which not a whole lot happens in a two-hour running time. The incomparable Scarlett Johansson (Lost in Translation) is Travolta's co-star and, while her sheer beauty and exuberance would be enough to carry her through the role, she takes the extra step and becomes this character. This is easily one of her best performances in her young career, which is only going to get better. Supporting performances by Gabriel Macht (The Recruit) and Deborah Kara Unger (The Game) are also solid, but this is clearly Travolta and Johansson's show. A Love Song for Bobby Long tells the tale of Pursy Will, a high school dropout who has learned that her estranged mother has just passed away and that her funeral is in New Orleans. When she arrives, Pursy discovers two smart yet troubled men living in her mother's house: Bobby Long, a former literature professor, and his prot—g—, Lawson Pines. Both men appear to be hiding secrets from their past, but the bigger secret that one of them holds directly involves Pursy. This newly formed trio initially argues about who is rightful owner of the house, but when Pursy realizes that Bobby and Lawson aren't going anywhere, she begins to adapt to living with them, even agreeing to go back to high school. Tensions constantly rise, and romantic relationships are even hinted at between a couple of the house's residents, but everything leads up to the reveal of a huge secret that could alter the way these people see each other completely. This project does have a very intriguing premise, and some of the two hours are quite compelling, but there's just way too much filler that kills any momentum that the film gets during scenes that Travolta and Johansson share. It's hard to believe there's any chemistry between these two, but there truly is. If only about a half hour had been shaved off of the running time (and the extras show us that there was a ton of footage that was cut! ), A Love Song for Bobby Long might have been more appealing, but, as it stands in its present form, it leaves much to be desired. The best part of the film is it's unique, beautiful look. Cinematographer Elliot Davis captures the essence of New Orleans, from it's nightlife to the beautiful old homes that line it's streets. Those making plans to take a trip to New Orleans should skip the travelogue and just give A Love Song for Bobby Long a spin. Image Transfer Review: The 1.85:1 anamorphic widescreen presentation is wonderful. This high definition transfer features excellent image detail, with bright, vivid colors used in bringing the beauty of the New Orleans setting to the screen. Contrast is well handled and shadows play a big part in this particular film's look, and fortunately, those are flawless as well. There's a bit of grain that pops up occasionally, but, for the most part, there's nothing wrong with the transfer as far as print flaws go. Audio Transfer Review: A Love Song for Bobby Long is almost entirely dialogue-driven, but the rear speakers do spring to life during a few sequences that feature a lot of music. The ambient sounds of these locations also come out of the rears from time to time, but everything else stays up front and sounds very good. Extras Review: The extras include a collection of trailers, including the theatrical one for A Love Song for Bobby Long, as well as an audio commentary track with director Shainee Gable and cinematographer Elliot Davis. This is a very good track, especially for one with the first-time director. She goes into great detail about her experiences in making her first film and talks about how important Davis was to the project. Davis also goes into great detail about how he was able to capture the look of New Orleans and translate these images onto film. There's also a very entertaining 28-minute documentary that goes behind-the-scenes to look at the making of A Love Song for Bobby Long. John Travolta and Scarlet Johansson sit down for interviews during this piece and tell some amazing stories about where they shot the movie and how great it was to work with each other. A collection of eight Deleted Scenes is also here, and it's easy to see why these were left on the cutting room floor. This is a solid DVD from Sony Pictures Home Entertainment, complete with an excellent video transfer culled from a high definition source, and a solid, involving audio mix. There are some nice extras too, with a commentary track, a better-than-usual making-of documentary, and healthy collection of deleted scenes on board.